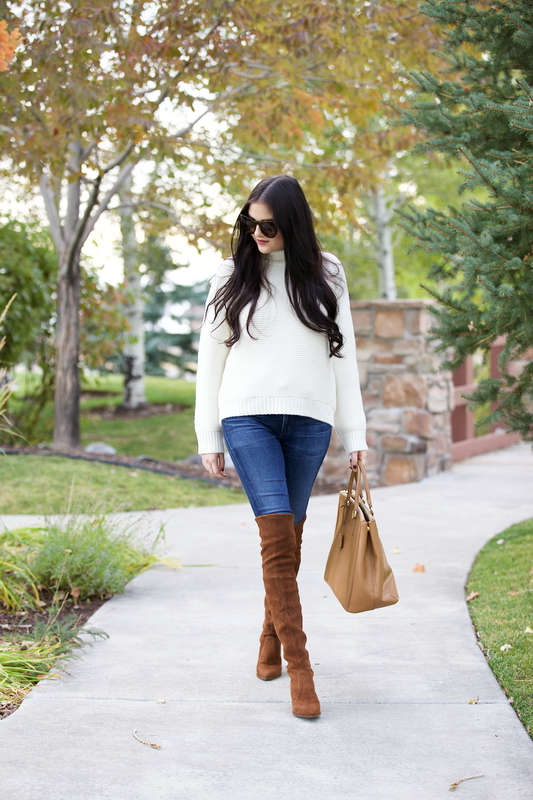 One trend I’m loving and that is super popular right now is over-the-knee boots!! I just found these Stuart Wetizman boots at Bergdorf Goodman and I’m already obsessed with them! The rich walnut color is gorgeous for fall and I love that they’re suede. They are definitely the “it” shoe for the season! 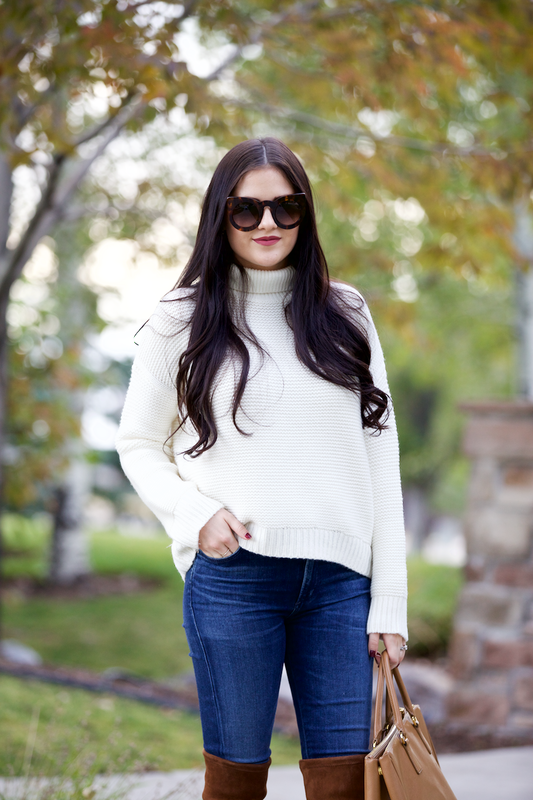 Pair them with a cozy sweater and your favorite pair of skinny jeans to create a perfect, effortless fall look! Also, Bergford Goodman has an amazing sale going on until Sunday!!! Spend at least $500 and get a gift card (more details below)! Take advantage of this event to stock up on some wardrobe essentials that you’ll wear over and over again! Here are a few items that are currently on my “wish list” that are trending for fall including more over-the-knee boots, top-handle bags, fall florals and anything velvet or metallic… Have a great weekend!! Brought to you by Bergdorf Goodman. Those boots look great. They make me feel so cozy when I look them. Great look! That sweater looks so cozy! This outfit is totally perfect and effortless! And your hair looks fantastic too! Gorgeous! I love the over-the-knee boots. I like that the heel is not too high, not too low. You also paired them with the perfect jeans! I love your look, simple but very elegant. It is perfect for use in cold weather. Stuart Weitzman makes THE most gorgeous OTKs ever! Love them! AH, the color of these boots is incredible! Literally the ULTIMATE cognac/fall brown. I’m dying a little inside. Maybe I can find a less expensive version somewhere lol. 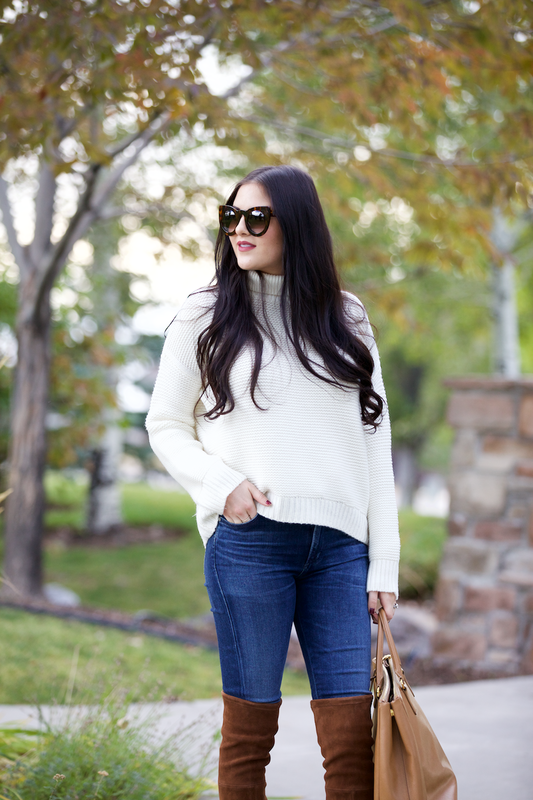 I can’t wait for sweater and boot weather here in Georgia…love this cozy look! I love those boot, can’t pull the trigger though. Have a great weekend! Fabulous boots! You’re looking so cute in this perfect for Fall outfit! 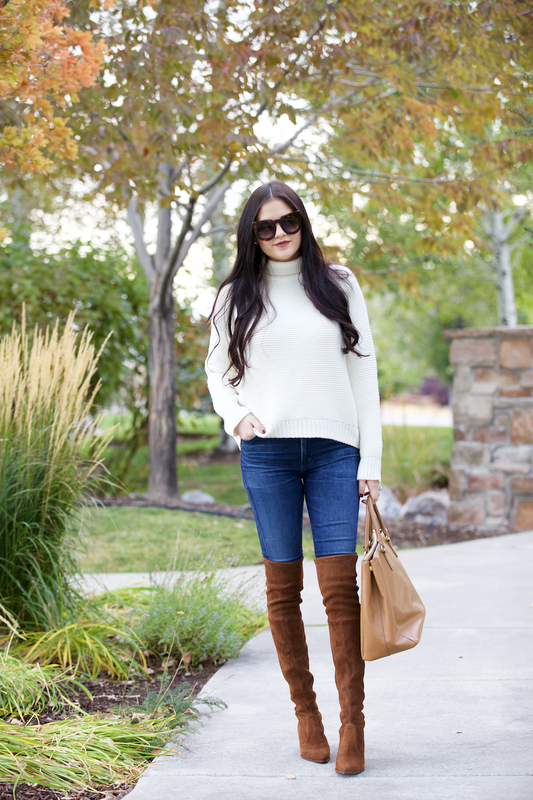 What could be better than knee high boots for fall? 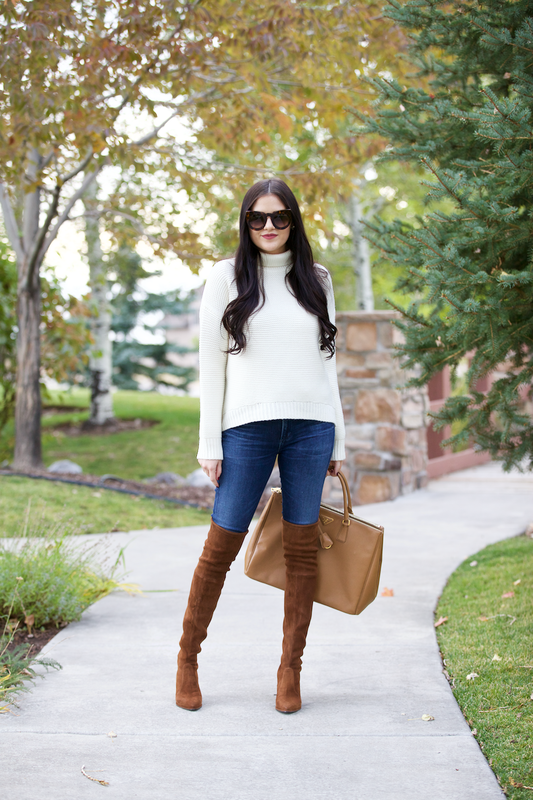 Knee high boots in tan-suede! I personally love the color of those boots. It blends so well with the upcoming season and extra points for Styling. Thank you! Yes I love the color as well! Those boots are everything! Such a cute autumn look! I love them! That walnut color is great for fall. Those boots are absolutely gorgeous! I love the color and the way they look paired with your white sweater, they really pop! I’m also loving those sunnies, too, so chic! Thanks for sharing this sale with us, as well as your picks; I’m loving that burgundy Givenchy bag! What a lovely and cozy outfit! Love the boots! I love this outfit those boots are amazing! I’m obsessed with those boots! love it! http://trendkeeper.me/ .. Favorite Platform Booties! This look is gorgeous! I’m obsessed! Love those over the knee boots! One question…did you use a surrogate? Love over the knee boots! What a cute look! I adore this look!! I can’t believe autumn is here! 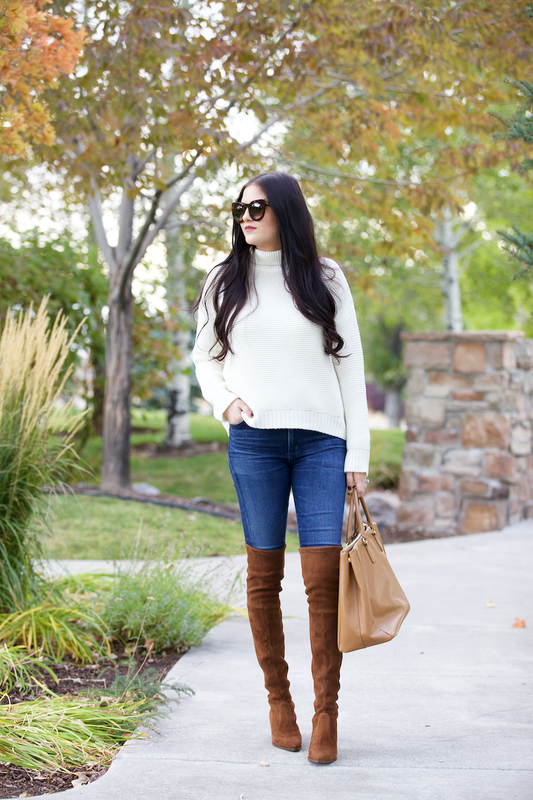 Love the over-the-knee boots trend as well! I love the color of these Stuart Weitzman ones and how you styled them! I love your sweater, its beautiful!! I went into Bergdorf Goodman today and asked them about this giftcard promo and they looked at me like I was crazy. They said it ended last week. Can you confirm if it’s still ongoing through Sunday? Hands down this is also my favorite color to wear. Love it! I am obsessed with the OTK’s from Stuart Weitzman. I think it’s finally time to bite the bullet and get my favorite grey pair! Hi! What color is your lipstick? Love it!